The Physical Activity and Health Promotion Lab is fueled and managed over time by a cadre of graduate students, Honors students and undergraduate research assistants that work collaboratively with our research teams on a number of different projects. Jeni is studying how activity-related behaviors influence pain symptoms and beliefs in individuals with chronic pain conditions. She is currently working on the Exercise and Brain Health Study, Health Coach Study, and SUMIT Study. Justin enjoys studying behavior change and learning what motivates people to make the decisions they do as it relates to their health and physical activity behaviors. He is assisting with U-Turn on the Health Information Systems, Monitoring & Evaluation team. Nick's research areas involve the importance of fitness to health across the lifespan. He is working on the FLASHE physical activity monitor study, and is involved with FITNESSGRAM. 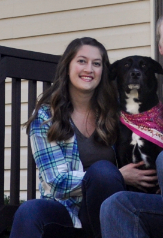 Katy is working on applied behavior change studies such as the Health Coach Study and the Fit Bit Study. She oversees coordination of the ExerCYse program and is a student leader on the CYdekicks health coaching project. (Click here for my bio page). María's research interests include the effects of exercise on mental health in clinical and non-clinical populations. She is working on the Chronic Low Back Pain Fitbit Study and the Health Coach Study.